(16/P76) TRENTON - The Department of Environmental Protection is awarding more than $1.5 million in grants to 32 municipalities across the state, Commissioner Bob Martin announced today. 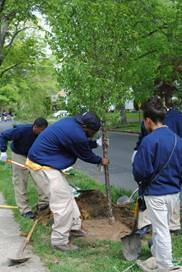 The awards, $1,564,000 in total, are being issued by the New Jersey Forest Service’s Urban and Community Forestry program through Community Stewardship Incentive Program (CSIP) grants. These grants are designed to promote stewardship of community forests and trees through the implementation of Community Forestry Management Plans. Grants range from $10,000 to $300,000 for work on projects from community tree inventory and ash surveys to risk reduction and tree planting. The 2016 CSIP grants are funded by the “Treasure Our Trees” state license plate fund, the Green Acres program, and the No Net Loss Reforestation program. Resiliency planning grants have been awarded to the following municipalities: Franklin Township (Somerset County), Interlaken, Montclair, Totowa, and South Brunswick. Hazard mitigation grants have been awarded to: Berkeley Heights, Bernards, Moorestown, Nutley, Pennington, Summit, and Washington (Burlington County). Reforestation/tree planting grants have been awarded to: Bergenfield, Bloomfield, Bound Brook, Caldwell, Egg Harbor City, Freehold Borough, Garfield, Ho-Ho-Kus, Jersey City, Lawrence (Mercer County), Leonia, Manasquan, Morristown, Plainfield, Ridgefield, Rutherford, Secaucus, Washington (Warren County), Woodcliff Lake, and West Windsor Township.